The HP Pavilion dv6-1130sa (£489 inc. VAT) is the latest addition to HP's consumer range. With its dedicated graphics and large quantity of memory, this laptop is a real bargain for those after an entry-level multimedia machine. The 15.6-inch screen provides bright, vivid colours and the 1366 x 768-pixel resolution means detailed images. Due to the size of the screen, working with multiple windows open is easy and while the Super-TFT screen is typically shiny, it isn't too distracting, even outdoors. 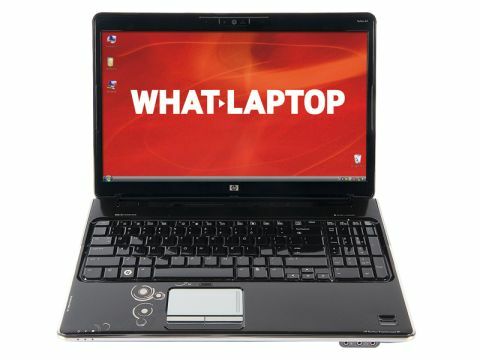 Unlike the Toshiba Satellite A350, this laptop boasts a dedicated graphics card, making it suited to multimedia tasks. While it certainly isn't a gaming system, basic gaming shouldn't be an issue. It also features 512MB of dedicated memory, a real bonus at this price point, which means older games will run smoothly. The laptop's styling is typical of the Pavilion family and is crafted from black plastics with HP's Imprint patterned finish. Build quality is excellent and a line of touch-sensitive buttons run along the top of the keyboard providing quick access to volume and media controls. The laptop's keyboard meets HP's high standards and, despite a little flex in the centre, provides a smooth and silent typing experience. There's even room for a dedicated numeric pad which makes data entry easy and isn't too cramped. At 2.9kg, this is one of the heavier machines about. The entry-level Intel Pentium dual-core processor is not very powerful. However, thanks to the generous 4096MB of memory, performance is satisfactory – although slow compared to some similar laptops – and light multitasking is not a problem. The 250GB hard drive is fairly standard for the group and provides plenty of room for music and video collections. However, if the laptop is used by the whole family, you might find the hard drive fills up quickly, and so the Acer Aspire 6920G-594G32Bn's 320GB hard drive might be more suited to your needs. The tri-format DVD optical drive is perfect for burning and reading DVDs. It also includes LightScribe technology, which enables you to burn an image or text on to the surface of the disk. This makes organising your disc collection simple. The 802.11g Wi-Fi isn't the latest technology, but will still provide fast access to the internet at home or in hotspots. FireWire and eSATA ports supply fast data transfer speeds and four USB ports let you connect plenty of peripherals. This is one of the best laptops we've seen at this price. It is feature-packed, easy to use and looks great. A faster processor would almost certainly have made this laptop a real winner.